Michael Lang, Jr. was born in Uhingen, Germany on March 12, 1848. His farmer father Michael, Sr., convinced by opportunities in America, left to get established in the Buffalo NY area before sending for his family. At age 4, Michael, brother John and his mother made the long trip boat and train to Buffalo, NY. However the senior Lang died of cholera while his family was enroute. Despite their grief and unable to even speak English, the family remained in the US with the help of the kind German community within Buffalo. At age 15, Michael was apprenticed to a blacksmith. At age twenty years, Michael had been visiting a cousin in Louisville, KY when he decided to enter the army. He enlisted in May 27, 1870 and was attached to George A Custer's command stationed at Elizabethtown, KY. Their missions included breaking up distilleries in the mountains and fighting the terror of the Ku Klux Klan in the years following the Civil War. In the Spring of 1873, Lt. Colonel Custer was ordered to the Dakota Territory. The change from the sunny south to the wind-swept prairies of Dakota disagreed with many of the soldiers, including Lang. He was ill much of the first year he spent in Dakota. Lang served as post blacksmith at Fort Lincoln. He was among the expedition which surveyed the route for the NP Railway. He also was among Custer's soldiers which confirmed the presence of gold in the Black Hills in 1874. He received his discharge papers in May 1875, just a year before the Company left for the Battle of the Little Big Horn. After his discharge, Lang worked as a civilian blacksmith at Fort Rice. Never very healthy, he abandoned the hard physical labor of the blacksmith trade and enter the business trade. 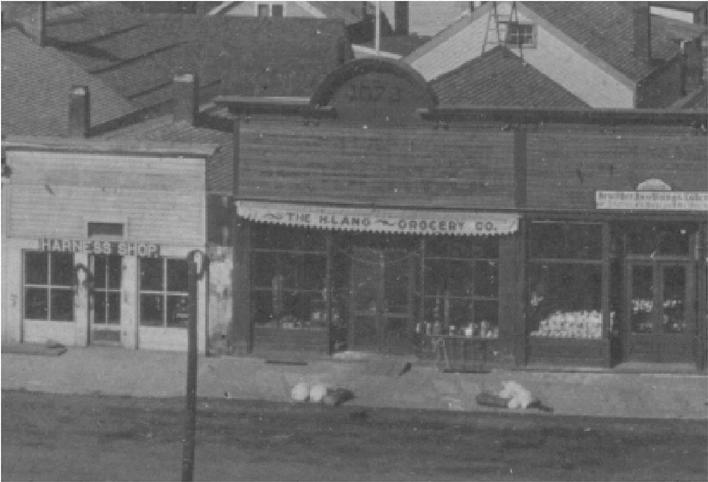 In the fall of 1876 Mr. Lang went to Bismarck and formed a partnership with John Yegen in a grocery and bakery in 1876. While Mr. Lang was in St. Paul learning bookkeeping, his partner telegraphed him to report their store had burned to the ground. Instead of finishing school, he redeployed his funds, purchased lumber and returned with it via train to Bismarck to rebuild. While attending school in St. Paul, Mr. Lang met his first wife, Hannah Sullivan. In 1878 he returned St. Paul to marry her and bring her back to Bismarck. Three children were born to them, daughter Maria and sons Michael III and William E. Hannah Lang died in February 1883. As soon as plats were filed 1879 for the new city of Mandan, Lang purchased land from the NP Railway. He built the city's first frame commerical building at the corner of Smith Ave and Front St (now 2nd Ave NE and Main St). 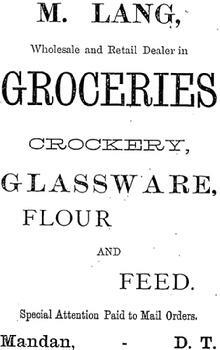 Lang's Store offered groceries, bakery goods and general merchandise, both wholesale and retail. He also built a the first frame house in Morton County on what was known as "Lang's Claim" located one-half mile north of Main Street. Mandan had no bank and all the money (mostly silver) taken in at the store had to be taken to Bismarck for safe-keeping. In warm weather Mr. Lang would make the trip by boat, In winter he walked across on the ice. Michael Lang, James Bellows and H.R. 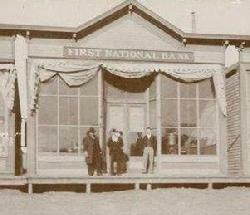 Lyons organized the First National Bank of Mandan on November 22, 1888. Lang was also instrumental in establishing the Emerson Institute which was home to many cultural and public events in the early 1890s. Michael Lang was appointed to the first Morton board of county commissioners by the territorial governor. 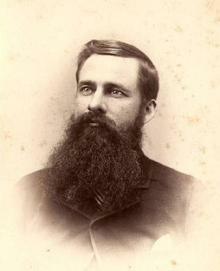 Mr. Lang was also an alderman of Mandan, a member of the first school board, and a member of the Mandan Board of Trade. He bought into multiple businesses; not so much as an investment as more to help businesses grow in the community. In this way he bought interest in the Mandan Steamship Company and the Pioneer Publishing Company. The flood of 1881, which peaked on March 31, stands out as one of the worst calamities in Mandan's history. The ice gorges backed up the Missouri and Heart Rivers, which submerged the business section and most of the residential sections of the city. Lang worked desperately to minimize damage to the store and save inventory. He stayed in his store until the rising water drove him out. Mrs. Lang attribued much of his late life poor health to his exposure during that period of time. 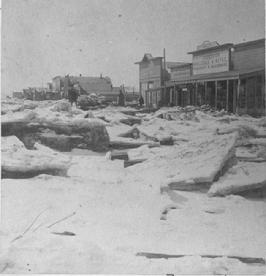 Click on the photo to the left to see the ice piles left in front of the store in 1881. His first wife Hannah was a Catholic and while she lived he always financially supported St. Joseph's Church, although he did not attend. January 8, 1884 Lang married Agnes Port, also an immigrant from Germany and 19 years his junior. They became members of the First Presbyterian Church and were active workers in that organization. He was also active in two fraternal organizations, the Knights of Pythias and the Royal Arcanum. In addition to his daughter Maria (b. December, 1878) and son Michael S. [Edith] (b. January 15, 1880) from his first marriage, Agnes and Michael had another three daughters Agnes [A.R. Bitzing] (b. March 1885), Rose (b. April 1887) and Blossom [McGillic] (b. July 1889) and another son Albert Custer (October 1891). His youngest son Edison York (b. April 20, 1894) had preceded him in death on August 12, 1898 due to a childhood accident. Another son William E. (b. July 9, 1882) from his first marriage also preceded him in death on December 19, 1898. 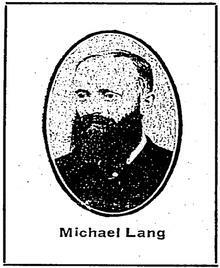 In 1900 because of failing health, Mr. Lang sold his store and retired from active business. Confined to a wheelchair during the last years of his life, he resigned all remaining appointments except the Vice Presidency of the First National Bank of Mandan. He held this office until his death. He suffered a stroke at home on Saturday morning December 2, 1911 and died later that day. The city's flag was lowered to half mast from the time of his death until burial. The funeral held at the First Presbyterian Church was attended by many pioneers from the county. Pall bearners included A.E. Thorberg, C.P. O'Rourke, B.W. Shaw, Olaf Killand, J.A. McDougal and W.A. Lanterman. Michael Lang is buried in Union Cemetery, Mandan, ND beside his wife Agnes, sons Edison and William.